Serves 1 chili loving family ! The air bristles with excitement on Sunday afternoons. My son and husband are very much into the football games this time of the year, and as you know, football means food. Both of them love chili and taste every ‘famous’ chili , wherever they travel. So when they vote my chili as their favorite, I feel like I have scored a touchdown with my family! I make different variations of this chili depending on the ingredients and time I have on hand. But this is my ‘go to’ recipe that I want to share with you all. Of course, my chili recipe has some Indian twists, like using turmeric powder for one. In Indian cooking, turmeric is used in almost all the meat and fish recipes that I know of. Plus we all know how good turmeric is good for health. So I always use turmeric powder in my chili. If you are like my son who does not like the raw taste of turmeric, the key is to stir fry it. Also, I made this chili with ground chicken but you may use the meat of your choice. 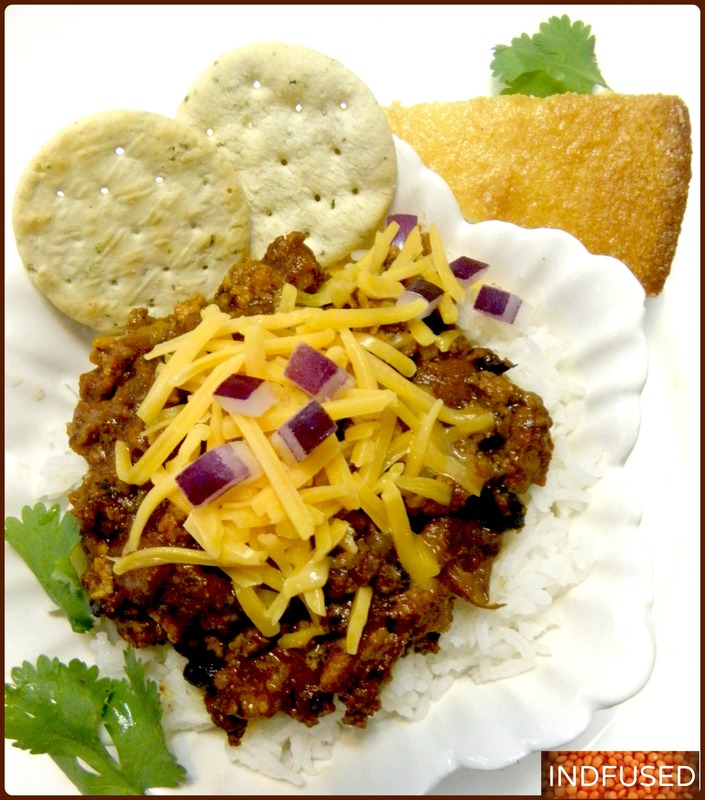 We like a thick consistency chili served on rice with sharp cheddar cheese and diced red onion topping and crackers on the side! I made cornbread for points after touchdown! 1 teaspoon red chili powder (or according to taste) I get the ‘medium’ hot chili powder from the Indian grocery store. 1 pound ground chicken. I used Purdue fresh ground natural chicken. 3 tablespoons Worcestershire sauce. I used French’s Worcestershire sauce. 2 ½ cups water or chicken broth. ½ cup each of the cooked red and black beans. I like the taste of black beans so I add them. You may use all red beans too. In a Dutch oven, heat the oil over medium heat. Add the diced onion and the grated garlic and stir until the onion is translucent, about 2 minutes. Add the turmeric powder and red chili powder and stir for another 30 seconds. Add the ground chicken and stir well. Reduce heat to low, add the all purpose flour, coriander seed powder, cumin seed powder and the dried oregano. Stir well until the meat is browned, breaking up any clumps of meat, about 5 minutes. Add the tomato paste, chilies in adobo sauce, ketchup, Worcestershire sauce, brown sugar, water or broth and salt. Stir well and cover. Let it cook covered on low for 20 minutes, stirring once or twice in between. Remove lid, stir in the beans ,cover and cook for another 5 to 7 minutes to assimilate the flavors. Remove lid, stir in the lime juice and serve. Cooked rice . I used Basmati rice. Shredded sharp cheddar cheese. I used Kraft brand. In my humble opinion, chili tastes better the next day. So I cook it the day before the game. For chilies in adobo sauce, I blend them, use what I need for the chili and freeze the rest for future use. Pumpkin Ginger Lassi- A Nourishing Treat for Halloween ! I do love a chilli, this one looks good! Thank you Lisa! It is my family’s favorite so I thought I will share it. Thanks for the recipe! Home made recipe is usually the best! Thank you so much Indah! Yes that is true because we can control what we want to put in. Looks delicious and it sounds like it is perfectly seasoned…wonderful mix of spices! Thank you so much! I make a vegetarian one with the same spice mix too. I loved your beautiful and profound thought on Nirvana. So true! I completely believe in it. Thank you Vineeta! This is a favorite in our house during football season too.